Leading off the site, we will answer “the 5 Ws” (who, what, when, where, and why) of Christian anarchism. But as we will conclude this first post with these simplified fundamental answers, we must first build preconditions. We will start by defining our terms. Then we will state a theorem. Next we will attempt up front to reconcile any objections. Lastly, we will draw a conclusion. addendum: As Christians, we believe that Jesus Christ is our spiritual King. Christ is God in essence, but is the Son in person. addendum: Many different “types” of anarchism are claimed, but we submit that anarcho-capitalism is the only true form of anarchism. We advocate a strictly peaceful transition to anarchism; read the About page for more. 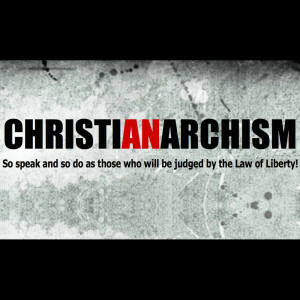 Therefore, we can form a definition for Christian anarchism: the advocacy of adherence to the Word of Christ – the Law of God – instead of government, the laws of man. addendum: Note also that we do not advocate a society where all members must necessarily be Christians. We merely hold that Christians should conform to the tenets of anarchism in order to exercise a consistent worldview and moral existence; read the About page for more. As our Creator, God wants us to focus on and devote our time (and a small portion of money) to Him and to advancing His kingdom. When we make God our Rock, our lives will gain stability and comfort, and we will gain wisdom. God is the ultimate Perfection, the highest standard of Good, and we are called to strive to live up to His greatness, though we know we will stumble every day. We know that the greatest way we can honor the Lord is to love one another to the absolute. Not just in the ways that comfort us, but in the ways that humble us, as well. The non-aggression principle holds that it is immoral to use any order of force against another who has not first initiated aggression (i.e., innocent or peaceful persons). Love your neighbor as yourself. A simple instruction, one which most of us probably grew up hearing and repeating. But statism does not honor this principle – in fact, it is diametrically opposed. How so? Statism is funded via forcible, involuntary extortion under the euphemism of “taxation”. At its most fundamental level, statism sends its enforcement agents to your door to take a percentage of your wealth, whether you’ve agreed to this or not. If you refuse to “pay up”, the agents will attempt to imprison you. If you refuse to be imprisoned, the agents will attempt to kill you. Statism, metaphorically, is a gun. If statism is aggression, aggression is the opposite of non-aggression, and non-aggression is the practice and manifestation of Love, then statism is the opposite of Love. If God is Love and statism is the opposite of Love, then statism is the opposite of God. Therefore, as Christians, we should be morally opposed to statism. James makes clear the fact that the Law of Liberty, or God’s Word, is to be our moral standard. Jesus teaches that his disciples should not be “rulers”, or “archists”. Therefore, what should they be? Then Peter and the other apostles answered and said, We ought to obey God rather than men! The apostles are absolutely lucent here: we ought to obey God rather than men. God raised a perfect Son; mankind destroyed him. How can we entrust power or lawmaking to any man? The state itself crucified the embodiment of Love and Salvation in the flesh! One of the Ten Commandments, this is a most primary (both basic and important) law which most of us probably learned even before our motor skills were fully functional. However, somewhere along the way, we starting making exceptions to this rule. When the state forcibly and involuntarily extorts property from a person, they are stealing. If any person on his own used force to take someone’s property against their will, we would recognize it for what it is: theft. How then do we make the logical leap that it is a moral act if condoned by the majority or if exercised by a man in a uniform? Jesus claims that the “teachers of the law” (man’s law) are unrighteous! We are taught not to join into oaths with other men, but to let “yes” be yes and “no” be no. We see a direct opposition to that in cultural traditions such as the Pledge of Allegiance. Throughout Scripture, Jesus refers to the tax collectors (also known as publicans) as the epitome of the evil, sinful, and unrighteous. This is reinforced in The Parable of the Pharisee and the Tax Collector, Zacchaeus the Tax Collector, and many other times. Again, the clarity of the statement shines bright: we are to have no other master but God the Father. For it is not those who hear the law who are righteous in God’s sight, but it is those who obey the law who will be declared righteous. (Indeed, when Gentiles, who do not have the law, do by nature things required by the law, they are a law for themselves, even though they do not have the law. They show that the requirements of the law are written on their hearts, their consciences also bearing witness, and their thoughts sometimes accusing them and at other times even defending them.) This will take place on the day when God judges people’s secrets through Jesus Christ, as my gospel declares. Paul tells us here that God’s Law is written on their hearts of all men, even the unbeliever whom does not keep God’s Law. Because of Christ, man’s need for governments was itself abolished; for where the Law was required to be taught and kept by governments, it is now known to every man instinctively in their heart, and whether or not they recognize it as such, they are convicted in their consciences by the Holy Spirit. But doesn’t the Bible tell us to be subordinate to our government? What can we infer from the latter verse? Does this imply that God honors or condones slavery? Or does it actually manifest God’s understanding of the times, a recognition of the reality of the evils that man has created that others must endure? But anarchism doesn’t account for the sinful nature of man! Ah, but it does! In fact, it is the only system which does so logically. The theory behind statism is, in order to ebb the sinful nature of man, to put other men (of sinful nature) in positions of power over them! What a farce! Is it any wonder how quickly governments become overrun through and through by corruption? No, the only wonder is how this idea of statism, what can only be seen as a bad joke, has instead been passed down through the generations into loving arms each time – a familiar demon. A common manifestation of this position is a negative response to the question “can man govern himself?”. On the contrary, we would submit: if man cannot govern himself, how then can he govern others?! But in anarchism, how would X get done? Anarchism does have practical solutions for every problem that statists argue must be dealt with by the state, and in the near future we will examine how some of the most imminent problems can be dealt with in the free market. But the greater issue is something we have already established: statism is immoral. At a personal level, we know it is immoral to steal from or use violence on an innocent person for any reason; whether to procure our own security, our well-being, etc. Regardless, there is no requirement for alternate solutions to exist, to simply know that the existing “solution” (or, more accurately, problem) is bad and should therefore be ceased. Okay, but how could any of this actually happen? Our first response is, certainly not overnight. As of this very moment, Christianarchism is “theoretical in practice, practical in theory” – i.e., we know it could work, but it would not work tomorrow. Only via an intellectual revolution/enlightenment/renaissance period similar to that during the founding of America, or of the Golden Age, whereby the populace comes to an awakening of both spiritual and philosophical principles, do we believe that a transition to anarchism is possible. Whereas we may advocate passive resistance and civil disobedience, we do not condone a violent uprising or overthrow of any sort, as such acts would be unscriptural, immoral, and nonviable. because rational anarchists continue to bring about a greater understanding of the virtues of anarchism, there is an intellectual revolution/enlightenment/renaissance period like there was at the US nation’s founding, and 30 years from now the populace votes in someone (or a party) whose platform is to disband the state and go to a system of anarcho-capitalism. the US government collapses in 20 years (which at this clearly unsustainable rate is inevitable) and everyone has to decide on a new state, or none at all. a “Free State Project” succeeds and peaceably secedes from the Union. Who: We believe that all men should be given the opportunity to live in a truly free society. However, strictly due to geographical location, our primary focus is on the people of the United States of America. What: Anarchism; an accountability to God instead of government. When: After an understanding of the virtues of anarchism have pervaded the society and the people of the intellectual revolution choose to cast off their chains, peaceably, as one. Where: Everywhere, but specifically, North America. See “Who”, above. and, most importantly, Why: Because Love and therefore non-aggression is not only the only moral system of man, but also because Love is God’s greatest commandment and until each of us fulfills that commandment – not only in body, but in mind – we are in rebellion towards God. “Christianity.” The American Heritage® New Dictionary of Cultural Literacy, Third Edition. Houghton Mifflin Company, 2005. 12 Mar. 2011. <Dictionary.com http://dictionary.reference.com/browse/Christianity>. “anarchism.” The American Heritage® New Dictionary of Cultural Literacy, Third Edition. Houghton Mifflin Company, 2005. 12 Mar. 2011. <Dictionary.com http://dictionary.reference.com/browse/anarchism>. Can you delve into Romans 13: 1-3 further? I’m wondering if what you are looking for is a Righteous Republic, rather than true anarchy. Great question! Personally, I would have no qualms living in a Righteous Republic; however, that is not what I endorse, as I do not believe in using force (or retribution) to hold others to a religious standard against their volition, outside of the non-aggression principle and its necessary descendants (such as contract). I always assumed that Nero and Rome was oppressive to Christians from the start. I didn’t know there was no compulsory taxation in Rome until 212 AD.